First off, Facebook is rolling out it's communal viewing 'Premieres' option, which it first announced back in April, to all Pages globally. As you can see, Premieres enables video publishers to air a pre-recorded video with all the features of Facebook Live - though with a prominent 'Premiere' tab in the top left corner of the screen, as opposed to a 'Live' marker. That's important, because a heap of Facebook Pages already air pre-recorded videos via Facebook Live, getting that extra engagement benefit that Facebook Live offers without having to actually broadcast something in real-time. Which is cheating, obviously. Facebook has previously sought to crackdown on fake live broadcasts, while Premieres now provides an option for those Pages to legitimately do the same, with the added transparency of the 'Premiere' tag. As you can see (briefly) in the video above, you can schedule your Premiere up to a week in advance. This then generates a post about your upcoming video, through which your audience can express interest, interact with each other in the comments, request an event reminder, and share it, all before the premiere date. "The announcement post then seamlessly turns into the Premiere at the time of its debut, and then into a regular on-demand video when the Premiere ends." In addition to Premieres, Facebook's also rolling out video polls more broadly. "Earlier this year, we started testing polling and gamification for videos to help creators and publishers invite audiences to participate and shape the direction of videos. Today we're announcing the rollout of Video polls to more Pages. Live polls are now available to all Pages through the Live API and publishing tool, and we'll soon be making it possible to add polls to on-demand video." 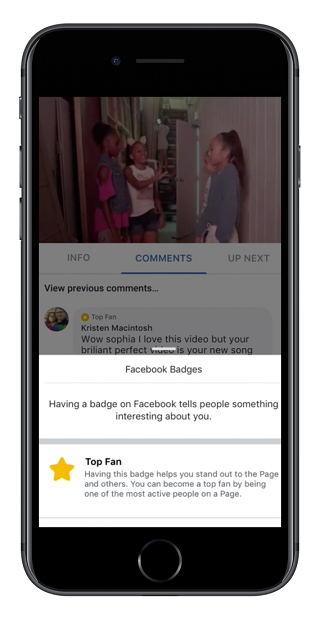 While it's also expanding it's 'Top Fans' program, which identifies your most loyal and engaged video viewers during the broadcast with 'digital badges', enabling you to prioritize interacting with them to further build community. It's interesting to watch how the social video trend has developed. Various studies over time have shown that traditional TV viewers are increasingly engaging on social platforms to discuss the content they're watching, with - according to previous research - up to 95% of online public conversations about TV happening on Twitter. That's what lead Twitter to make its big video content and live-streaming push - with so many people discussing their favorite TV shows on the platform anyway, why not merge the two, and capitalize on its unique strength. The extension of that lead to the rise of live-streaming, which, somewhat logically, generates up to 6x more engagement than static video content. That's because people can interact with the video content, they can 'like' certain moments - the immediate response aspect of live-streaming is a key feature, so it makes sense that viewers would be more likely to use it. So, social platforms know that users are engaging with social during TV broadcasts, and that the interactive options provided in live-streams do indeed spark more activity. It follows then that if you can add all of these together, you win. Right? Part of the problem with this conclusion is that TV is embedded in our media consumption process, it's habitual - and the big networks also tend to have the biggest and best shows which people actually want to discuss online in the first place. So while these new options from Facebook do cater to trending actions, on paper - and online viewing is increasing and moving to take on traditional TV - it's not there just yet. To make Premieres a really valuable option, Facebook first needs the content to draw audiences in - which it's working on with the development of Facebook Watch. It then likely needs to build a critical mass around such discussion, which, inevitably, will also mean that Premieres will need to air in prime time, when TV networks are also airing their top content. I guess, both issues come down to content quality - if Facebook can provide credible, popular, TV-like alternatives, then you can imagine Premieres will be a step towards that next level, tapping into the aforementioned usage trends and melding them into one on a single platform. But it'll take some time for it to become a significant option. That's not so bad, Facebook has time - but what it does need is some truly great, compelling content that draws audiences to Watch. That's obviously what's needed for Watch growth overall, but it also relates specifically to Premieres, which looks to use trends that both Google (through their communal YouTube viewing app 'UpTime') and Facebook itself (via 'Watch Party' for groups) have already tried tapping into with minimal success. Basically, these are good, interesting additions, but in order for them to take off, the content, as always, remains the key.